Happy Holidays, everyone! Hopefully you’re keeping yourselves warm and toasty during these long winter nights in the northern hemisphere and cool in the shade for those south of the equator. Here at Kumulos we’ve been keeping warm by writing code. Lots and lots of code to keep bringing you new features in our industry leading Kumulos platform. And, in the spirit of giftgiving, we wanted to let you know about some of the awesome new additions we’ve made in the past few weeks. First off, we’ve added a couple of new features to Kumulos Analytics to give you the most comprehensive view of how your app is performing. From the app store and active downloads to engaged users and retention – Kumulos Analytics is your one stop shop and gives you a world of app use data at your fingertips. The most exciting new addition is app session information. 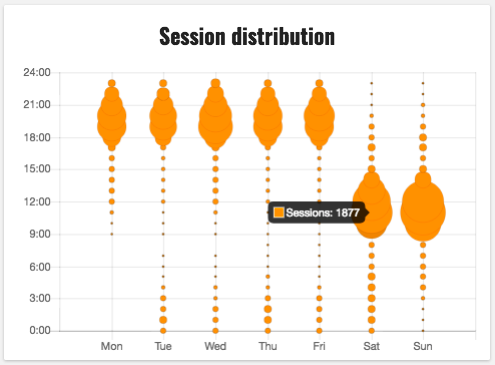 You can now see session distribution, frequency. length and the number of sessions per day for any app using Kumulos analytics. Pretty cool. The other addition to Kumulos Analytics is the ability to change the time period for analytics data to fit your needs. Want to see your app performance for the past 30 days? Yep. It’s there. How about 60 days? That too. You can also view analytics for the last 120 days, 6 months, 12 months or all time. That enough data for you? A webhook, for those of you not in the know, is an HTTP POST request to the Kumulos backend. And now you can now create webhook URLs to any of your Kscript API methods in Kumulos. What’s a webhook good for? Instead of your app having to wait for an event to complete or continuously poll another service, webhooks notifies your app backend when a specific event occurs or certain data becomes available. Webhooks can make your app run lightning fast – something we know every app user appreciates.You can read more about webhooks and how to get using them in your apps in our comprehensive Kumulos documents. We know you love using all the Kumulos features like app store optimization, crash reporting and push notifications, which is why we’ve made it even easier to add these to your app. When trialing a service in Kumulos, the number of days left in your trial now shows in your dashboard. To add a feature to your Kumulos subscription, simply click Buy. That’s it. If this is your first service, you’ll need to add your billing details to your account. You can read up on how to add features to your account in our – you guessed it – comprehensive Kumulos documentation. And that’s it from us for December. Thanks again for using Kumulos and – if by chance you’re reading this and you’re NOT using Kumulos….well, you’ve seen what we’ve added in just the past few weeks. Just wait until you see what we’ve got for 2018! Why not get started with Kumulos today?